Forty-six Bloomington restaurants will be serving up their tastiest dishes to large crowds this weekend at the 31st annual Taste of Bloomington. Large crowds visited the Grunwald Gallery of Art to view more than 90 artworks that aim to expose issues with gender, identity, sexuality and reproduction at the opening reception of the eighth annual Kinsey Institute Juried Art Show Friday evening. Robin Carlson’s day job may pay the bills, but those fleshy, twitching doll heads won “Best in Show” Friday evening at the 2013 Kinsey Institute Juried Art Show. The Kinsey Institute will present an opening reception its Juried Art Show Friday from 6 to 8 p.m. in the Grunwald Gallery. Every Tuesday in Peoples Park, different musical performers will present free lunchtime concerts to the public as a part of the Bloomington Summer Performing Arts Series. The Indiana University Dance Theatre’s “Global Perspectives” production presented dance from around the world to Bloomington audiences Friday and Saturday at the Ruth N. Halls Theatre. The Annual Faculty and Guest Artist Concert featured traditional and contemporary dances representing themes within a global community. Researchers found that girls of both races and black boys were more likely to have low self-esteem due to media consumption. IU’s Arts Week Everywhere has featured events to display the variety of local talent, and more are still to come — including a performance by the African American Dance Company. This Is Tango Now, an Argentine tango dance company based in New York City, performed its first national touring production, “Identidad,” this weekend. Crowds of about 230 people attended the two performances of dancers and musicians at the Buskirk-Chumley Theater. Seventeen women representing their sorority chapters have been practicing and fundraising for weeks in hopes of being crowned the first-ever Miss Greek IU. Delta Chi fraternity will put on the first pageant this Sunday in Alumni Hall in the Indiana Memorial Union to benefit the V Foundation for Cancer Research. This Is Tango Now is an Argentine tango company founded by Alfredo Minetti, who earned a Ph.D. in cultural anthropology at IU. It works to push the boundaries of traditional tango. 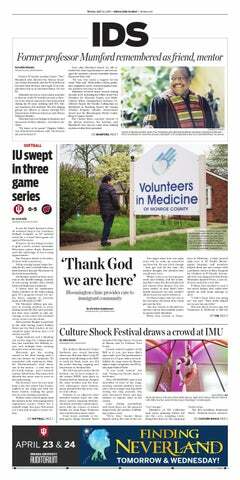 IU Health Center nutritionists and counselors said they were concerned by what they read in the article “Big dreams, thin figures” that ran in the Indiana Daily Student three weeks ago. It is no secret that a long, lean figure is preferred in ballet, but the vulnerability to eating disorders and the health risks associated with ballet is something most dancers would prefer to sweep under the rug. Ten Evidence dancers told stories of the African diaspora with their movements on the IU Auditorium stage Saturday. An audience of 700 people watched expressive jumps and turns set to music ranging from funky rhythm and blues to African drumming. The three dances each contained a message, bringing to light topics of self-image, slavery and universal compassion. Senior Jared Boze has a Skype session with friends in Germany, and junior Heather Price drinks English tea. Boze and Price are working to stay in touch with the cultures and people they recently left. After months of studying abroad, they have returned to campus life at IU. The African American Dance Company held its semi-annual auditions last night. The 17 first-time auditioning dancers and five returning members performed to African beats in hopes of being a part of the company for the 2012 spring semester. Some people have called it “a circle of happiness.” Freshman Sarah Mancourt calls it “the magical portal to positiveness.” Mancourt is referring to her hula hoop. The women’s club soccer team will travel to Phoenix today to play in the 2011 NCCS National Soccer Championships. Twenty-four of the top women’s teams in the country will compete at the Reach 11 Sports Complex. For more than 25 years, the City of Bloomington Parks and Recreation Department has coordinated the Summer Performing Arts Series to showcase local talent. The department will continue the tradition for summer 2012 and is seeking musicians and bands to participate in the summer series, which will take place May through September in city parks. The IU African American Art Institute Dance Company will have its 13th Annual Dance Workshop at 7 p.m Friday and Saturday in the Grand Hall of the Neal-Marshall Black Culture Center.